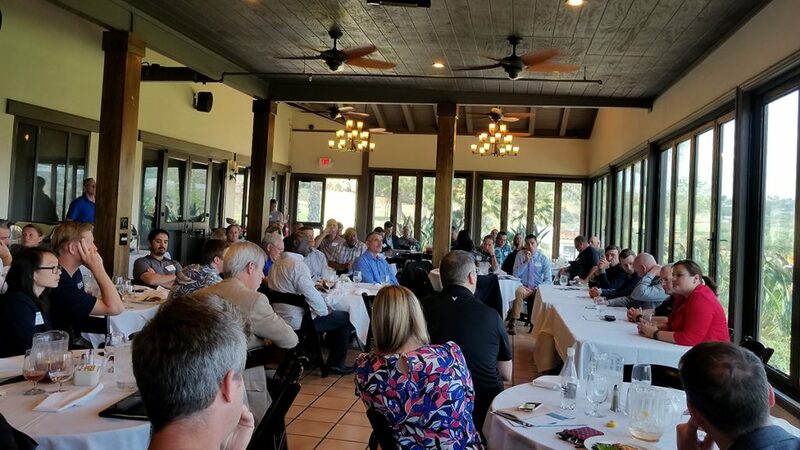 The San Diego Chapter of the Association for Unmanned Vehicle Systems International came back strong for 2019 with a Q1 chapter meeting in a new format and an exciting current topic. Lunch and networking at the Admiral Baker Golf Club were followed by an expert panel discussing progress in the San Diego Integration Pilot Program (IPP). IPP is a three-year program sponsored by the Department of Transportation (DOT) and the Federal Aviation Administration (FAA). The purpose is to develop commercially viable use cases for Unmanned Aerial Vehicle (UAV) technology in a controlled space. IPP programs (there are ten nationally) receive improved support from the FAA for the approval of waivers to FAA regulations that would normally prohibit some operations such as flying over people and Beyond Visual Line of Site (BVLOS). The panel comprised Tiffany Vinson, San Diego Office of Homeland Security (IPP program administrator), Jesse Gipe, Director of the World Trade Center, Lt. Chris Kelley with Chula Vista Police, and Jim Rector, Flight Operations Program Manager with GE/AiRXOS. The panel agreed that participation from FAA was much better under IPP, but that the agency was still understaffed for all of it’s responsibilities. Going forward the shortage of qualified drone pilots, especially those with domain expertise such as First Responders, would continue to be an issue that would probably get worse before it gets better. In Chula Vista, the drone program powered in part by control software from Cape had responded to over 300 calls which led to over 50 arrests. Congratulations to Monica England, SD AUVSI’s new president and the rest of the chapter leadership! We look forward to the next meeting.